The top floor of the Red Hat parking day on a typical Friday afternoon. A month or two ago, thousands of visitors descended on downtown Raleigh for a convention at the Raleigh Convention Center. Some may have been in hotels nearby but most were driving into town and were looking for parking. The decks underneath the Marriott hotel and city plaza were open and cars filled them as usual. The problem? No one, or no technology, was there that day to tell those visitors that those areas were for monthly pass holders held by office tenants nearby. This breakdown in the system that day caused delays and frustrations by office workers. I saw this in my officemates that drove (I happened to walk in that day) and showed up stressed because unlike a typical day, the parking decks were slammed. It didn’t help that the convention kicked off with a 7 am breakfast that hundreds (thousands?) showed up for, beating the office workers in that day. This is one example of many showing that our parking supply is reaching a maximum and headaches like this give downtown a negative image to a certain degree. It’s being worked on though. The feedback is loud and clear. Parking in downtown is not as easy as parking in the suburbs. I’ve met folks who don’t come to downtown because they hate the parking experience. I’ve also heard of downtown businesses who don’t consider opening in downtown because of the parking experience. Yet, the amount of downtown residents, businesses, and retail has been going up so something is working. What we may be facing soon is the large build-out of parking decks in the 1990s and 2000s has now reached near capacity. I’m starting to think that the decks along Wilmington Street (City Center deck, Moore Square Station Deck, etc) were actually a major asset in recruiting business and fueling the revitalization of the 2000s and 2010s. I feel that the city is 100% acknowledging that structured parking is expensive. In my opinion, I feel the city should be a partner in downtown parking management rather than being in the business of it. Lots of privately-built parking at The Dillon. For example, the city is leasing spaces in the 1,000+ space deck at The Dillon in order to support the upcoming Raleigh Union Station. Rather than build it themselves, we have a public-private partnership to help spread out the cost and leave the city flexible in the future. Instead of the city building more parking decks, offering alternatives to get in and out of downtown must be explored. When it comes to bike accessibility, more bike lanes have been placed over the past few years. This summer, we should see Raleigh bikeshare up and running. Bike corrals have been popping up. We’re also experimenting with cycle tracks. Frequent mass transit is the eventual goal to take pressure off the parking problems in downtown Raleigh. With the 10-year transit plan only really starting in 2017, we’ve got a long way to go. So how do you implement short-term solutions until bus-rapid transit, frequent buses, and a commuter-rail line are running in 2027? The TBJ (subscription required) published an article about this very thing. The headaches caused by a thin supply of parking are forcing those behind-the-scenes to come up with new ideas. Everything from reducing parking space sizes to paying businesses for unused spaces is being considered. 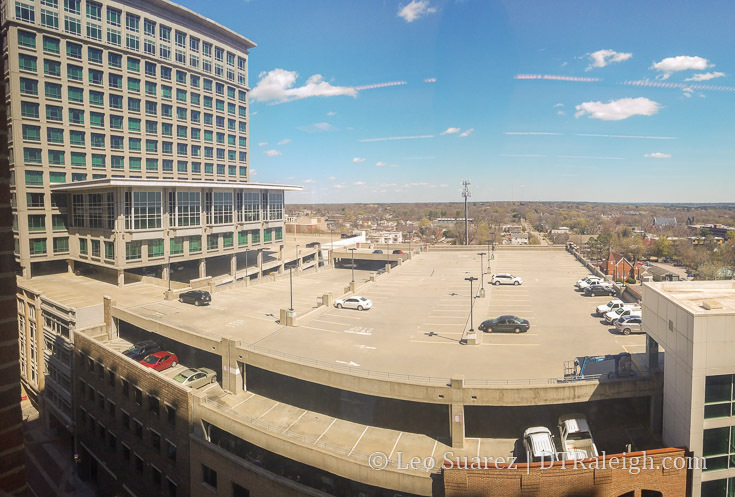 I’m going to pick on Red Hat, their parking deck is shown in my photo at the top, but the same applies to other companies in downtown Raleigh as well. I can easily guess that the fine folks there tend to work remote on Fridays as seen from their lack of cars in their deck every Friday. It gets me thinking that one big short-term solution is not exactly to tackle the raw parking supply issue but rather the parking supply USE issue. We have to start dropping the mentally that spaces are for a specific company or use. Spaces are for cars to sit in. What the person then does afterward doesn’t matter. I’m not sure what that might look like but when you take into consideration that structured parking costs around $20,000 per space, you can see real savings here spending money on innovative solutions rather than doing the same old same old. I think this will be important to follow and I’m hoping that we can get it right. A mishandling of this issue may slow downtown development momentum as transit is coming but still a ways out. I am of the opinion that any money that would be spent on building and servicing debt for new parking should be spent first on those innovative solutions you mention. A lot of times when there is a parking crunch in one part of town there may be space in other decks. A real-time information system that covers *all* major lots and decks – city, county, state, and private, with signs posted at major entrances to downtown, would go a long way. Perhaps increasing service on the R line to help link people from parking to destinations would help too. Just another issue we’re facing because we build cities for cars instead of people. 1) Raise the price of parking. All of a sudden, using an alternate mode of transportation (or even carpooling) will seem like a better option. 2) Revise the regulations for on-street parking. Turn two hour spots into one hour spots, and so on. 3) Build those dang hotels! Conventions cause a parking crunch because attendees are driving in from Crabtree and North Hills hotels. If they’re staying downtown, they won’t need a car. I would start by expediting the southern route of the bus rapid transit and have a partnership with a developer to build a massive parking deck (3000+ spots) right along the I40 corridor. People still want to drive unfortunately so get them to park somewhere where they don’t affect surface traffic as much. Plus this would generate demand for the BRT. Also why is this city so against protected bike lanes? They cost peanuts, you don’t even need an expensive solution you can start with raised asphalt bumps and work more advance protected bike lane solutions later. Putting parking information on an app can work, but it needs to be seamlessly built into the navigation system being used. But most people drive to their destination, and only then begin to look for nearby parking. It would be great if parking information (open spaces available nearby) could be displayed on digital signage that would include data from surface lots and on-street spaces in addition to parking decks. 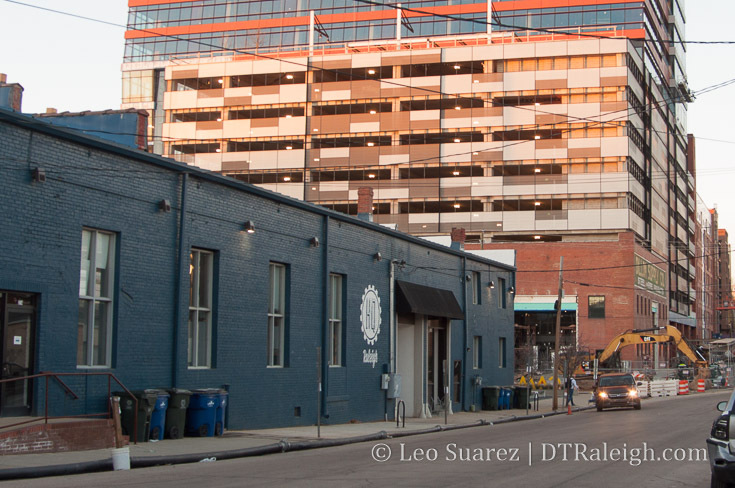 RLine is a key asset here, as long as the city can adequately describe its use in conjunction with currently available parking opportunities throughout downtown. I think that the $20,000/space cost for new garage space is a low figure if you consider that you have to purchase the land that those garages occupy and divvy that up among all the spaces built. Sorry, editorial note in a prominent place: spell check needed for “oppurtunity”. I use the R Line to get around. It’s convenient and I can track it on my phone. A coordinated wayfinding strategy will help with navigating parking. My suggestions would include clearly identified public parking, digital signs showing number of available spaces, and signs that indicate the downtown districts that the deck serves (ie Capital District, Fayetteville Street) . As someone who enjoys data, I’d like to also see a report that shows the change in parking demands. This could help balance parking needs with transit, bicycling, and walking. that problem has been resolved (to a certain extent). Anthony perhaps you like I are a leisurely user of DTR. I never have problems snagging a metered space unless it’s a very busy night like first Friday, etc. Perhaps it’s not as convenient as structured parking, but I like the idea of highly organized park n ride as a transit oriented solution to the problem for office workers. It seems that large parking areas on the perimeter of DT (not far, maybe one off capitol and off saunders) with frequent shuttles into Fayetteville street, Glenwood, and warehouse district would lighten the burden on DT parking and in turn take less cars off the DT streets during peak pedestrian hours. This could be coupled with bikeshare, which would work well because most bikes would be DT while workers are downtown and vice versa when people are parking in the mornings. Which building do you think will start construction first; FNB or 400H? FNB is supposed to break ground in April. 400H is supposed to start in 2019. Also, just my 2 cents. Bikes are great but I’d pay 20 bucks to park my climate controlled car rather than bike everywhere. It’s bike weather for like 4 weeks a year here. Park and Ride with shuttles and parking decks are what we need until we have real public transit in this region. Which will be when I’m too old to go downtown. Also, there’s almost no traffic downtown compared to big cities. And I can find parking on the street almost all the time. Worst case I pay a couple bucks and park in a deck. Ever been to Boston? I used to drive thru there all the time. Nothing but traffic and 50 dollar parking decks. It’s almost laughable to worry about traffic and parking in downtown Raleigh. Interesting, on the website of 400H they state that construction to begin in 2018…? As a DT homeowner, my goal is to never have to drive my car downtown. It’s slowly getting there with grocers and future retail on the way. Bike and RLine will do just fine, and I’ll Uber/Lyft when the weather is particularly horrendous. The website says 2018 but I talked to the person in charge of renting out the space and he said 2019 for construction beginning. Most of Raleigh (95%+) doesn’t live downtown, so I think realistic, and not social engineering, proposals need to be looked at seriously, and soon. @Jeff, to be fair, one can argue that our dependency on cars for almost everything has been the biggest social engineering experiment in American history. I think the results are clear. Cars aren’t going away, and effective planning needs to address that. I’m very much pro bikes, mass transit, and smart development. I’m also a realist. Oh for sure. Cars will be here for awhile and to plan or call for people to start living without them is unrealistic. Raleigh should strive for reducing car trips or even allowing households to own less cars. As someone who’s family (with 1 child) recently went from 2 cars to 1, I can say it’s possible in Raleigh but takes a major alignment in expectations, work location, lifestyle, and weekly trip planning. As that becomes easier then I hope others will also take this route. Bikeshare would be an alternative option to shuttles, not the default. And although traffic DT is not that bad compared to other cities, the goal is to create a better city through superior planning. My friend was mildly hit by a car 3 weeks ago as he walked in front of an alley. Of course you can’t prevent these situations, but reducing private cars DT is a step in the right direction, and saying that it’s not that bad compared to Boston should.not be an excuse to not improve. I used Mass Transit during the Work Week, and then Uber on weekends. Coming from New York I never needed a Car. But since Living Here in Raleigh, I find it abit Shocking that Everyone uses their Cars rather than taking GoRaleigh/GoTriangle Buses to get around. Since riding the Buses….I see why. I just believe that in a city like Raleigh, you should have some kind of rapid transit, Light Rail in placed to relieve the Congestion on the Highways during rush hour traffic. is it wrong in saying this ? if someone lives in Raleigh and works in Morrisville and does not own a Car it can be a challenge. Not trying to say do away with Cars altogether, but have Better Transit so that using a Car is not as Much dependent. Extended night time Bus service, more Park n Ride locations, and Dare I say this again…..Light Rail. Light Rail from RDU to Downtown Raleigh/Durham/Chapel Hill express and Limited stops. The below ground decks in Zurich had lights above the spots that were red when occupied and green when available. Also most of them are built to be driven only one way -with parking spaces at an angle, saving even more time/convenience.